But I think that is the temptation that the church has fallen for. That being big, having brilliant personalities, and preachers, that this is what will save the church. Bonhoeffer disagrees, and so does Jesus. What will save the church is people serving faithfully like Jesus to the world around them. So to talk about this obviously we needed to talk about the TV show the Bachelor. You might not think that serving has anything to do with the Bachelor, and well you may be right, but here is what we learned on Sunday. I believe that the TV show “the Bachelor” highlights a lot of our contemporary culture’s values and beliefs. The show has real people saying things that I think give us insight into some of the cultural waters we live in. And one thing you will notice again and again if you ever watch the show is how naturally selfishness comes out. People will say things like, “I just need to explore all my options”, or “I have to follow my heart, and so break yours”. Or even the whole premise of the show isn’t really to find love, it’s not to be rejected leaving without a rose. So what’s the point? Well it’s pretty simple. Selfishness is deeply rooted in our culture, it is often celebrating in our culture, and it’s actually killing our culture. No world, culture, neighbourhood or friendship can survive the black hole that selfishness creates. So how do you break selfishness? That’s what we looked at for the rest of Sunday, examining Philippians 2. In Philippians 2 we read that we must have the same attitude of Jesus. Paul says get rid of selfishness and all its forms. Stop trying to impress people, making yourself out to be great. Focus on humility, don’t just look out for your own interests, look out for others. And Paul then says, “be like Jesus”. He is seeking to ground this advice of rooting out selfishness in the practice and life of Jesus Christ. Jesus did not seek to grasp his rights, follow his own desires, but instead emptied himself and served others. This is to be our model as Christians. We are to give, to serve, and to empty ourselves. In essence, Paul says serving others kills selfishness, and moves us in the direction of Christlikeness. Serving others must be at our centre, because it was and is at Jesus’ centre. Our world may be trapped by self-interest but we don’t need to be. We can live differently because of Jesus, we can live like Jesus. We can serve, sacrifice, give, and break selfishness in all its forms. We can love the world, and change the world by serving the world. So we ended with a pretty specific call and challenge. To actually serve at least weekly, intentionally. The truth is that unless we plan how we will serve, life will get busy and make the choice for us. It is far easier to watch the Bachelor than mentor a youth. It is far easier to Facebook than to serve in a soup kitchen. It is far easier to watch a movie than it is to serve your community. But it is not better. So my challenge was simple – find a way to serve at least weekly. Weekly is really the minimum. It is something we should be doing daily with our lives. But weekly is a good start. So that was the challenge and it’s a challenge I think we need to do for our lives. To be like Jesus, serve, kill selfishness, and love the world. Selfishness is killing our culture. We have accepted the belief that following our hearts fully is admirable and courageous. Greatness isn’t about yourself it’s about what you give, sacrifice, and how you serve. Serving others is the thing that kills selfishness. If you are truly serving it will be an inconvenience to you. Sometimes serving is hard, but it is never wasted. If you don’t plan how you will serve, you won’t. To change a life, give of some of your life. What stuck out to you from the sermon? What was challenging to you? What was new? Do you think that selfishness is a problem in our world? Where do you see it? Now where do you see it in your own life? How can serving help to break self-interest? When have you served and been changed through it? Where can you start to serve weekly now? Is there a place in your church, community, neighbourhood? When will you start? Teach your kids about the importance of serving. Choose a place to serve together. Maybe it’s to make cookies for neighbours, to go to a soup kitchen together, to go to the Gleaners, or other places as a family. Find a way to serve and go about it, make it happen, and see how it starts to change you. 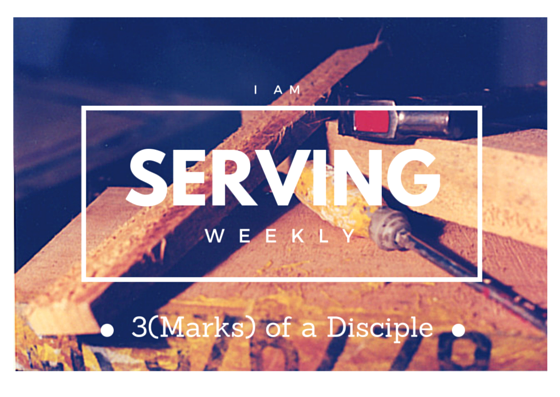 Challenge for the Week: To intentionally serve weekly.